jQuery also provides different visual themes; via their ThemeRoller interface. WP Edit Pro has taken the 25 most popular ThemeRoller themes; and made them available for selection. The default jQuery theme used by WP Edit Pro is called “Smoothness”. jQuery Smoothness theme in drag and drop panel. jQuery Smoothness theme in popup window. 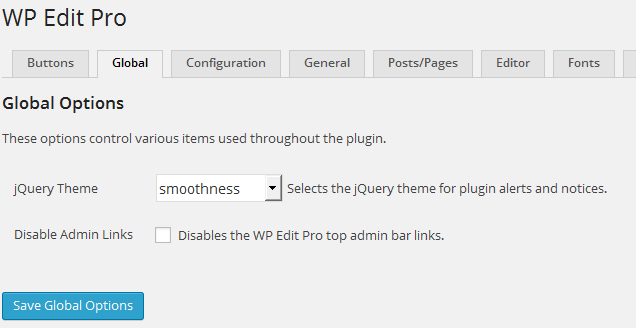 To change the jQuery theme from the default “Smoothness”; visit the WP Edit Pro admin settings page -> Global tab. Here is an example of using the “Sunny” theme, instead. jQuery Sunny theme in drag and drop panel. jQuery Sunny theme in popup window. WP Edit Pro includes 25 of the most popular jQuery themes.